One of my favourite blogs that I recently started following is The Art Of Manliness. The title of blog is pretty self explanatory but if you need help with it, it is dedicated to “reviving the art of manliness.” Need I say more? The wonderful people at AoM just debuted a new comic titled, “Dim and Dash.” To sum it up, this comic is the man version of “Goofus and Gallant.” Now, if you were a rad child like me, you spent your dull hours in the doctor’s waiting room finding the hidden pictures and reading said “Goofus and Gallant” comics in the popular Highlights Magazine (I happily still browse that magazine whenever I come across it). If you don’t know, Goofus and Gallant were used as role models: Goofus always made the wrong choice while Gallant did the opposite, what was right. So here, “Dim and Dash” will be offering exactly the same advice, except with more manly themes and subjects. 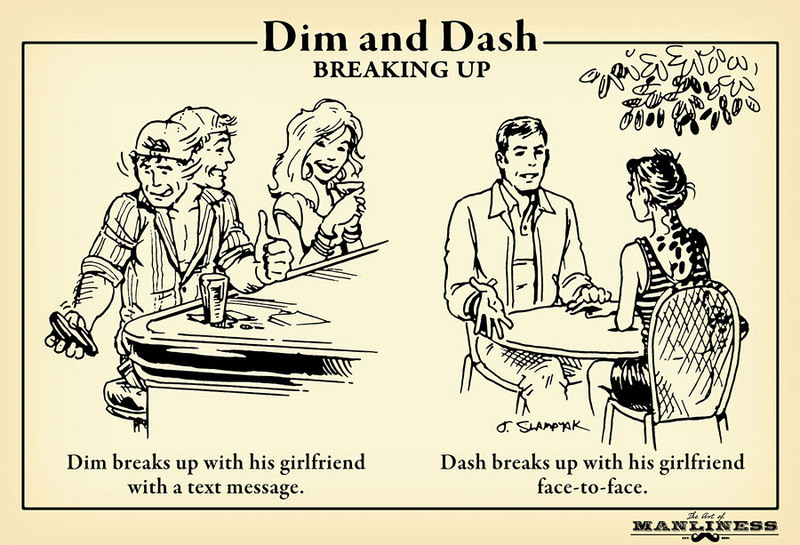 Drawn by Ted Slampyak, “Dim and Dash” has already won me over. It is going to be a twice monthly comic and frankly, I can’t wait for another! Indeed. I loved G&G so much growing up – this was an instant love.